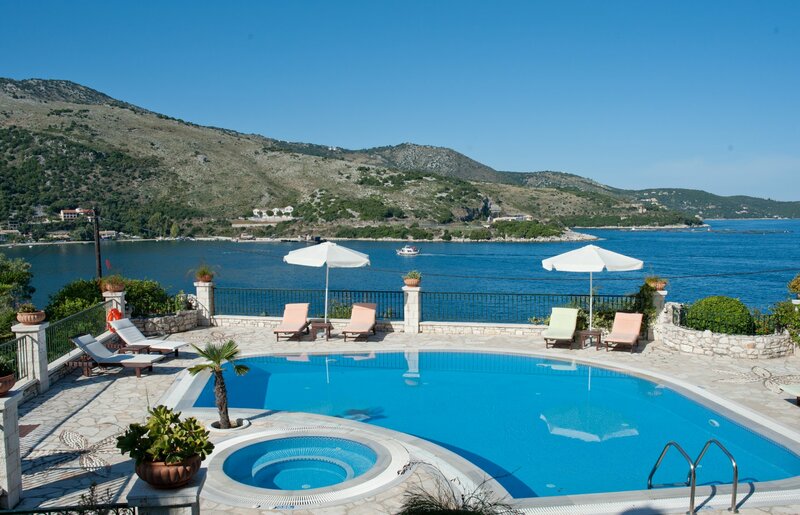 Situated in a unique and quiet area below the castle of Kassiopi among the olive groves and just above a picturesque secluded beach , is villa Kamelia. 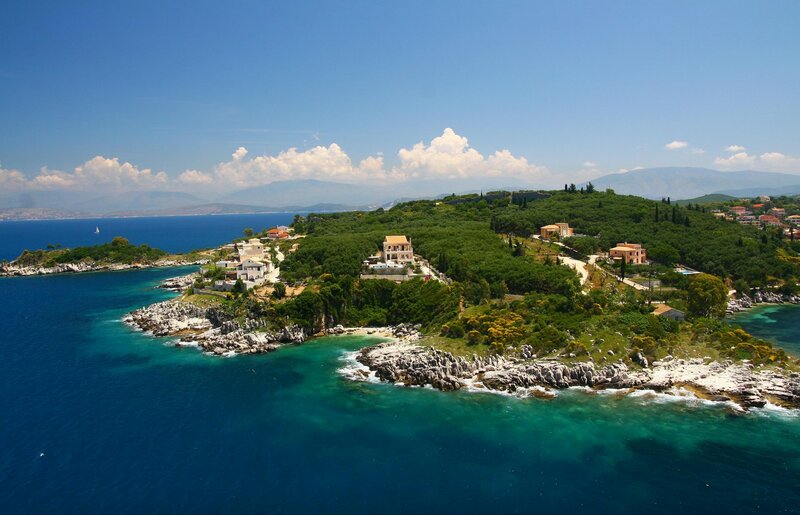 The combination of an elegant traditional Corfiot house and it’s large swimming pool, nestled in a natural surrounding, snuggle the peaceful ”Grava” small beach with crystal clear water , are some of the reasons why villa Kamelia will offer you an unforgettable holiday. a short distance walk from both picturesque harbours but also an isolated surrounding is ideal to make you feel that you are experiencing a unique holiday. This four-bedroom villa can sleep a maximum of 8 people. Attractive split-level design with many terraces overlooking the beautiful coastline of the north part of the Island, verandas from which to enjoy the comings and goings of the fishing boats in the harbour . The house offers stunning sea views and superb views of the Islands’ spectacular sunsets.High stoned walls and olive groves surround the villa ensuring exceptional privacy. All 4 bedrooms have individually controlled air-Conditioning, wooden floors, well designed ensuite bathrooms and their own Satellite TV, central heating for when necessary. 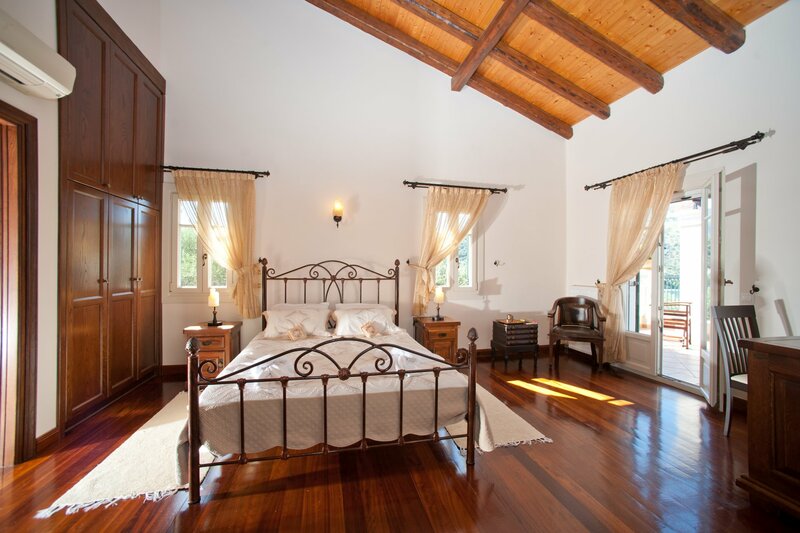 Bedrooms are cleverly situated , two on the upper floor, one on the middle floor and one on the lower floor, also ideal for two families sharing the villa. On the same floor is the laundry room. the beautifully furnished air-conditioned comfortable sitting room with modern artwork around a handsome marble fireplace , satellite T/V, home Cinema ,DVD, stereo , and the lovely open-plan lounge/dining area await you. Utility room adjacent to the kitchen with plenty of storage space and a visitors WC are discreetly placed. The fourth bedroom with it’s ensuite bathroom is situated on the lower ground floor, offering all the same luxuries plus an extra door to the pool and barbeque area ensures extra privacy if desired. The lower floor contains also the garage and adjacent fully equipped utility room with both washing machine and tumble drier also ironing facilities. A magnificent bean’ shaped large freshwater swimming pool, overlooking the sea,which curves around its own jacuzzi. A tranquil sun terrace around the pool with beautiful pebble mosaics, and a conveniently situated stone-built barbeque , forms a lovely relaxing al fresco dining area and an excellent choice for large parties. It is quite conceivable that guests might choose to while away their entire holiday here. 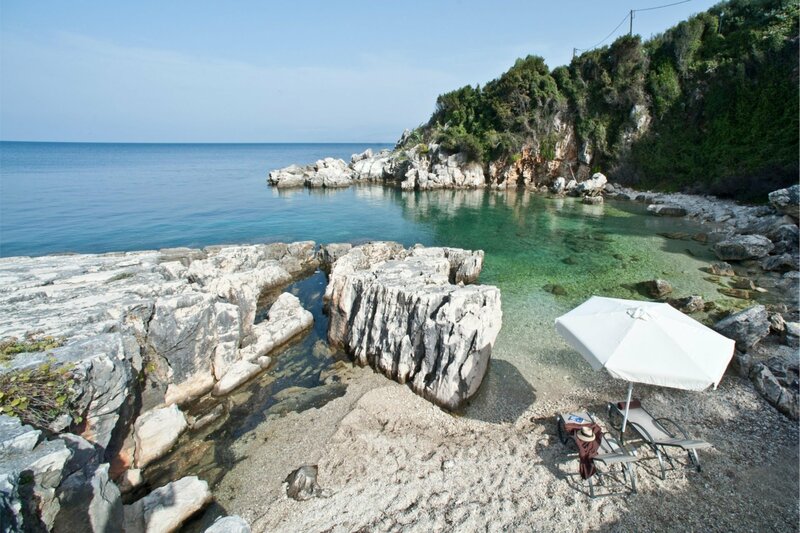 Easily reached foot path to the small beach directly below the villa will offer excellent rock bathing. Even in the height of the summer the beach is surprisingly little used, and the clear blue sea invites you to swim, snorkel and dive to your hearts content. Clients who choose to hire a boat may anchor out in the bay underneath. Copyright © 2014 Villa Kamelia. All rights reserved.